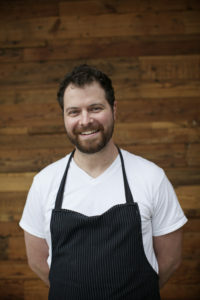 Bryce Gilmore is the owner and executive chef of Barley Swine, Odd Duck and Sour Duck Market in Austin, TX. His journey from bussing tables to managing a restaurant has been one that has spanned over most of his life and had him migrating from Texas to San Francisco, to Colorado and back. After opening Barley Swine, his first brick and mortar in late 2009, Gilmore was named a Food & Wine Best New Chef and James Beard Foundation Award (JBFA) semifinalist for Rising Star Chef in 2011. In March 2012, Barley Swine was also named one of GQ Magazine’s Best New Restaurants. Both Odd Duck and Sour Duck Market were named Bon Appetit’s Top 50 Best New Restaurants in 2014 and 2018, respectively. Gilmore was again honored by JBFA as a semifinalist Rising Star Chef 2013 and a Best Chef Southwest finalist in 2013, 2014, 2015, 2016, 2017 and 2018. Growing up in the restaurant industry with a chef and restaurateur father, Jack Gilmore of Jack Allen’s Kitchen in Austin, Gilmore was introduced to the industry at a young age. He started bussing tables at 14 and began serving at restaurants throughout high school. Ready to move behind the line, he moved to San Francisco after high school to attend the California Culinary Academy. Following graduation, he returned to Austin and worked at two well-known local institutions, Wink and Moonshine Restaurant Patio Bar & Grill, before working as a sous chef at Café 909 until 2007. Gilmore then headed back to San Francisco to work at Nancy Oakes’ Boulevard Restaurant. After a year out West, he then landed in Colorado where he worked at the former Montagna Restaurant and Bar (now Element 47) at famed hotel, The Little Nell, in Aspen, Co. His time in Aspen proved to be a great one, where he learned the importance of quality ingredients and where he met future business partner, Mark Buley, who would later move to Austin to become Gilmore’s partner in Odd Duck and Sour Duck Market. Back in Austin, the food trailer scene was just beginning, and Gilmore moved home to open his own food truck with one stand-apart element: a focus on local purveyors and ingredients. In 2009 he opened his first eatery as a food truck, Odd Duck Farm to Trailer in South Austin. At the trailer, Gilmore created his dishes with fresh and locally sourced ingredients; this philosophy would become the cornerstone to all of his restaurants moving forward. Odd Duck received major recognition from both local and national media and was featured on Anthony Bourdain’s No Reservations and Andrew Zimmern’s Bizarre Foods America. Following much success with his acclaimed cooking, Gilmore leased a space and opened Barley Swine in December 2009 which eventually earned Gilmore much of his national acclaim.The trailer closed in 2011 when the land it sat on was sold for development. Years later, Gilmore revived the trailer as a brick and mortar on the exact land as part the development included a free standing restaurant. In December 2013, Odd Duck opened its doors serving lunch, dinner and Sunday Gilmore/two brunch weekly. In 2016, the ever-evolving Barley Swine relocated to a much larger space in north Austin, began serving a la carte style as well as tasting menu, and added a full bar that focuses on hyperseasonal cocktails. Most recently, Gilmore opened his third concept in 2018, Sour Duck Market, a full bakery and all-day café with full bar, beer garden and bake case. Gilmore has spent the last decade in Austin building a restaurant group with a cornerstone of supporting local farmers. All three of his restaurants source all ingredients from small, nearby farms. Anything they can’t source, they make; and anything they can’t make, they don’t serve. Menus sometimes change daily based on what is delivered by the local farmers. Gilmore has become synonymous with supporting the local food movement here in Austin. When not at his restaurants, Gilmore can be found shopping at farmers markets, supporting local food charities and planning his next culinary venture. When moments of freedom arise, Gilmore enjoys spending time with his wife, Molly, and son, Field, watching football, and relaxing by the lake with a beer in hand; a quintessential Austinite.